Mystery Object, photo taken in August of this object ploughed up in a field on an Aberdeenshire Farm belonging to my Sister-in-law and Brother-in-law,both Orcadians,i t has been cleaned and given a coat of paint.It is about the size of a small Omelette Pan,we had a lot of discussion about what it was used for ,obviously for melting some mineral. Added by Phil Brough. Could this be connected with cheese making? Could be for melting lead in for musket balls as the size of the pan would give a fairly accurate amount. Or even smelting gold in. Just a couple of ideas. Is it for taking the blood from a stone. Just a guess, but what about a griddle for roasting meat? The fat (or some of it) would run down the narrow metal channels to the larger one and then out to the side where it could be collected. It's for beating dishonest politician's that you voted for !!! I keep returning to this object and racking what's left of my brains. Not knowing anything about omelette pans, I'm guessing it isn't more than about 6" - 8" in diameter. It seems to me unlikely that it was used in connection with molten metals: the handle doesn't appear to lend itself to insulation of any kind - it looks complete as is. The object is shaped like a dipper, but a dipper that would let most of what it was dipped into escape. The channeled 'spokes' (for want of a better name) seem to be designed to work with a rather thin liquid, so maybe the thing was used to collect small amounts of such liquid from a vessel also containing something thicker. In other words, it's a sort of strainer-in-reverse. Only small, rather slippery things could readily fall through the slots, so I'm imagining it being used to get, say, samples of whey out of the cheese pot. But why would anyone do that? Coming back to this after eight years, I did some digging around in Google images and think I've got the answer. 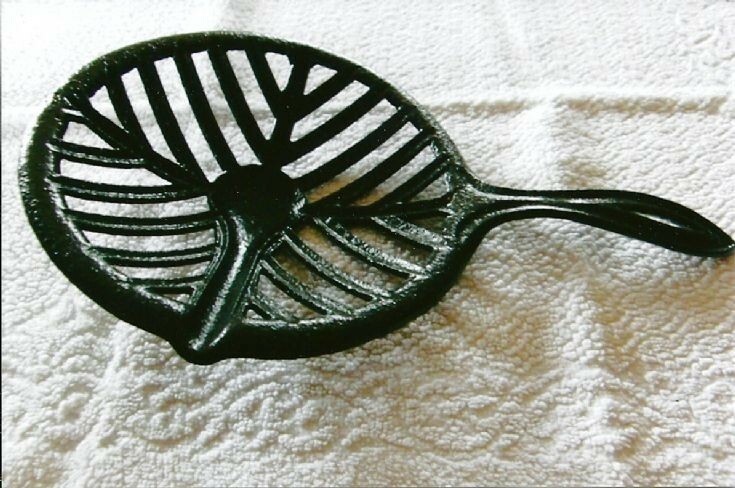 Searching for "antique cast iron broiler" produces photos of some things that look rather like this. I agree, Paul. The mystery object would support a steak (or whatever) over another pan, and carry excess fat/liquids to the side, where they would be collected or discarded as required. Good sleuthing! My mistake was in supposing the thing was complete in itself.